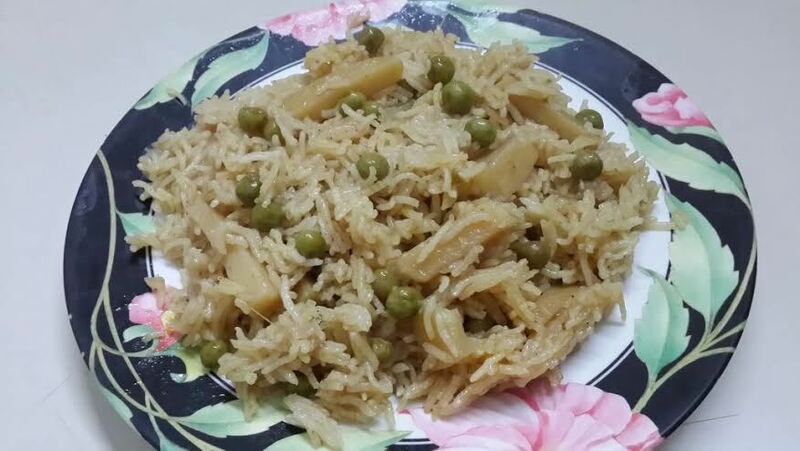 Simple, easy to make and healthy, all comes in this matar pulao. Its a great combination of rice with peas and is perfect at the time when you do not like to have curry with your food. Heat oil in a pan and fry onion till golden brown.Take out the fried onion and chop it. In the same oil add black pepper, clove, green cardamom, black cardamom, cinnamon, ginger garlic paste and strips of potato.Stir fry for 3-4 minute. Now add 1/4 cup of water. Cook for 5 minutes until potatoes are half cooked. Add boiled peas, salt, chili powder and chopped green chilies, mix well. Again stir fry for 5 min. Add in soaked rice and 2 1/2 cup water.Cook on medium heat until the water has almost absorbed by the rice. Cover the pan and cook on low flame for 10 minutes so that the rice are set. Turn off the heat and serve hot with raita.